Dr Ahmad Badreddin Hassoun, Grand Mufti of Syria, with interpreter, giving evidence to the Oireachtas Joint Committee on Foreign Affairs, Trade and Defence. Ivana Bacik is an Irish Labour Party Senator for Dublin University. On 17th November 2016, the Russian Ambassador to Ireland attended a public hearing before the Committee, and I questioned him closely at that meeting about his government’s attacks on civilians. More recently, on 1st December 2016, a delegation of religious leaders drawn from different faiths across Syria, together with two Syrian surgeons, Dr Ahmad al Khaddour and Dr Bashir Mohammad, appeared as witnesses before the Committee. 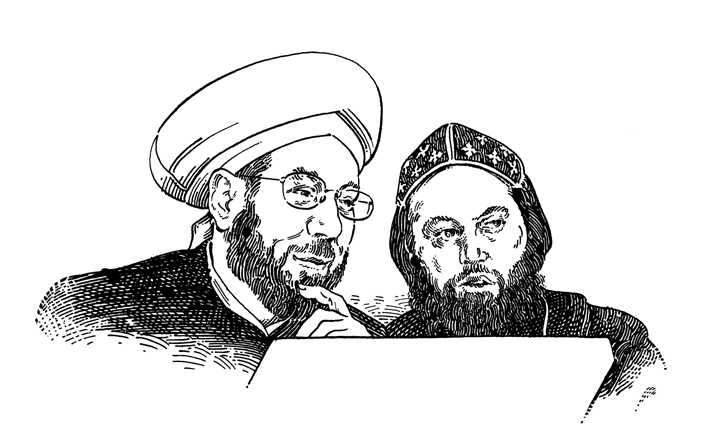 They described themselves as a ‘Syrian peace delegation.’ Their members included Dr Ahmad Badreddin Hassoun, the Grand Mufti of Syria. Senior patriarchs from the Eastern Orthodox church also addressed the Committee. However, in their presentations it became very clear that all five members of the delegation were strong supporters of the Assad regime. None of them criticised the actions of the Syrian president, or his international allies, Iran or Russia—even when I raised specific instances of regime brutality towards civilians with them. In particular, I had a lengthy exchange (through an interpreter) with the Grand Mufti, Dr Hassoun, in the course of which he denied that either the Assad regime or Russian forces had carried out atrocities in eastern Aleppo. I asked Dr Hassoun if he would condemn any Russian complicity in war crimes, but he replied, ‘Russia and Iran did not kill any civilians. They came to defend the Syrian people.’ I challenged him that his assertion contradicted the view of the international community. But again he responded by blaming the opposition for destruction of civilian infrastructure; not the regime. The focus for this so-called ‘peace’ delegation was clearly aimed at seeking support from Irish parliamentarians for the lifting of sanctions against the Syrian government. At a later Committee meeting the same day, we heard from Robin Yassin-Kassab, co-author of Burning Country (Pluto Press, 2016) and a contributor to this publication, Syria Notes. In his presentation, he described the earlier delegation as ‘propagandists’ for the Syrian regime. He also confirmed to us the distressing reality that Assad’s forces are bringing about complete destruction of the moderate secular opposition in Syria. Further reading: Controversial Syrian cleric denies Russian atrocities, Harry McGee, The Irish Times, 1 December 2016. Transcripts of the hearings of the Oireachtas Joint Committee on Foreign Affairs, Trade and Defence. This address was given as oral evidence to the Joint Committee on Foreign Affairs and Trade of the Oireachtas, the Parliament of the Republic of Ireland, on 1 December 2016. Liberated Aleppo is falling. The suburbs of Damascus are falling, or have already fallen, and been cleansed of their recalcitrant population. The families of foreign militiamen are moving in. Silence is returning to a devastated and demographically-changed Syria. This presentation is therefore more a lament for the defeated Syrian revolution, and for our failure to help it, than a policy recommendation. From Spring 2011, in the context of the Arab Spring, millions from all backgrounds protested peacefully against torture, crony capitalism, corruption and poverty, and for freedom, dignity, and social justice. They called for the unity of all sects and ethnicities. The regime deliberately started a war because it knew a serious reform process would end in its demise. It calculated (correctly) that in a war situation it could count on strong foreign allies—unlike its opponents. And it was following the blueprint laid out by Bashaar al-Assad’s father Hafez. In the late ’70s he had met a widely-based challenge with severe repression. This provoked a desperate armed uprising by the Muslim Brotherhood in the city of Hama in 1982. The regime responded by razing the city centre, killing tens of thousands. The memory of this destruction kept Syrians silent for the next three decades. In 2011, while the regime was detaining and torturing tens of thousands of non-violent protestors, it released 1500 Salafi-Jihadists from its prisons. These include Abu Muhammad al-Jolani, the leader of Jabhat al-Nusra (now called Jabhat Fatah al-Sham), Zahran Alloush, the founder of Jaish al-Islam, and Hassan Aboud, the founder of Ahrar al-Sham. The regime practised a scorched earth policy on the areas it couldn’t control, burning the civilian infrastructure and driving millions out. This provided the vacuum in which transnational jihadist groups could thrive. The Assad regime has old links with Daesh (ISIS), having helped set up its previous incarnation the Islamic State in Iraq (ISI). For over a year after it set up in Raqqa, Daesh and Assad didn’t fight each other. Even today, when the Free Syrian Army is fighting Daesh, the regime bombs the Free Army. An arsonist dressed up as a fireman, Assad has used Daesh—an enemy of the Syrian revolution—to present himself as the ‘lesser evil’ (although he is responsible for far more killing). Russia used Daesh as an excuse for its bombing, but over 80% of Russian bombs have fallen on the revolutionary areas, not on Daesh territory. Yet even in these conditions, the Syrian revolution survived. Still today half of rebel fighters fall under the loose Free Syrian Army umbrella. This means they are ‘non-ideological’ in the sense that they are fighting only to defend their communities, to bring down the regime, and to allow the people to decide what comes next. But the revolution is represented by its civilians more than by its fighting men. In areas liberated of both Assad and Daesh, Syrians have set up hundreds of local and provincial councils, half of which are directly elected by the men and women of the area (the other half are quasi-democratic, practising various forms of internal and community voting and consensus). Women’s Centres have been established, and educational and health projects, and independent trades unions. In a country once called ‘a kingdom of silence,’ there are over sixty free newspapers and tens of free radio and TV stations. This is what is being destroyed today. Qatar, Saudi Arabia and Turkey provided some arms to some sections of the opposition, but in an inefficient, disorganised and insufficient manner, and for their own reasons. Far from this being a Western regime change plot (as many choose to believe), President Obama’s most significant act was to veto the Qataris, Saudis and Turks from delivering the defensive anti-aircraft weapons the opposition so desperately needed. Obama prioritised his deal lifting sanctions on Iran in return for nuclear compliance, and implicity recognised Iranian ‘assets’ in Syria. After the 2013 Sarin gas attack, Obama’s ‘red line’ vanished, and the US took to treating Syria as an extension of the ‘war on terror.’ Donald Trump seems set to continue on this course. Iran and Russia have intervened on a massive scale. 80% of the pro-Assad ground troops attacking liberated Aleppo are foreign Shia militiamen organised and commanded by Iran. Assad controlled less than a fifth of the national territory before Russia’s savage imperialist assault. Assad’s army hasn’t won a battle by itself for years. By now its most effective units answer to local warlords rather than through a central hierarchy. In the West, in general, we failed to understand the revolution. We failed to offer solidarity or even to see through propaganda. The right saw the revolution and counter-revolution in outmoded security terms, and so did much of the left, wasting time with conspiracy theories, orientalist myths, and inaccurate commentaries on proxy-war chess. We will live with the consequences. Walter Benjamin wrote, “Behind every fascism is a failed revolution.” New forms of fascism are rising east and west as a result of our collective failure. What should Ireland’s government do? Civilian protection should be an urgent and immediate priority. Half a million have been killed, over 90% at the hands of the regime and its backers. Twelve million are displaced. Humanitarian assistance is essential but insufficient. Ireland should call strongly for a ceasefire, for safe zones, for prisoner releases, and for sieges to end. As much diplomatic and economic pressure as possible should be brought to bear on Russia and Iran to deter their assaults. Russia should, for instance, be excluded from the SWIFT banking system for its repeated war crimes (employing incendiary and cluster bombs, and bunker busters, on civilian areas, and targeting schools, hospitals, and aid convoys). Iran’s Shia occupation forces in Sunni-majority Syria are one direct cause of the rise of Sunni jihadism. Irish investment in Iran should be suspended until Iran removes these forces. War criminals should be prosecuted. In the medium term, Ireland needs to work out how to deal with what is in effect a foreign occupation in Syria. The armed rebellion will continue as a long-term rural insurgency. This will often be framed as a national liberation struggle. Ireland and others will have to be prepared for the jihadism and sectarian conflict unleashed by the tragedy. Jihadists will be immeasurably strengthened by the defeat of the revolution in the urban areas, to the same extent that democratic revolutionaries will be weakened. This moment—the fall of Syria’s Sunni-majority cities to Russian bombers and an international Shia alliance, facilitated by the West—will mark a new stage in the development of jihadism. Robin Yassin-Kassab is co-author with Leila Al-Shami of Burning Country: Syrians in Revolution and War. Further reading: Addressing the Oireachtas (Me and Hassoun), Robin Yassin-Kassab. The rise of Syria’s local councils, by Robin Yassin-Kassab and Leila Al-Shami, Syria Notes No. 10, 17 May 2016.